Conclusion: My first reaction was that perhaps your camera was creating strange orbs when it caught dust, and giving them strange shapes and substance. But the orb is hidden behind the speaker, and this suggests to me that it is a true orb. And if it is a true orb, the other two in the photo might be as well. But I can't say for sure. My opinion on this is: Inconlusive, but leaning towards true orb. It doesn't look or feel angry to me though. I know you seem to think it's making an angry face. To me it just looks like it's watching. Any negative vibes in the house? Because this orb as a negative entity doesn't feel right to me. Conclusion: In my opinion this is a true orb, it appears to be moving through the fire screen, and appears to have movement and a face. It appears to be watching, but more friendly than the other two orbs. I don't believe that this orb is caused by the same entity that caused the ones in photo 2. I believe that there is more than one force in your house. One quite friendly and that is watching over your family, particularly your son. And an indifferent spirit, that is just watching. Anyway...that's what I think/feel about your photos. Correct me if I'm wrong. these are some photos that we took yesterday in follow up from our hallow eve's vist to a potentially hauntd site, where according to folklore, an evil witch lived. there are a few weird things that showed up in the pics that I was wondering if anyone could give me some insight as to what is going on here, thanks. ok these are pics that were taken the day after we posted about the kneeling figure. these will not go upp either. sorry, i dont know whats going on here. Interests:Trained Skywarn Stormspotter/chaser for the NWS in Shreveport LA.<br />Founder and lead investigator in the E.TX area for a paranormal group. i had washed my car three hours before the picture was taken.the picutre taken is on a major roadway that runs north and south (highway 69)if you want to look on a Texas map. there is no lights within miles (except a house light that sits half a mile off the main road and is on the left hand side,the face is on the right side). the moon was not out and there was an overcast.the only light i had was that on my camera and i was standing a good ten feet away from the car. You are right Darklighter,we do need more proof.that is why i am carrying my team out and do all kinds of test with our equipment.we will interview the people around the area,and go back and talk to the police department to see if they still get reports. NO Need to correct. I think you did a wonderful job. I know that some of the orbs are reflections but I see some expecially a few that had very clear faces in them. Mainly the ones that I pointed out. MY House feels very comfortabe and so far firendly. Much like our old house. Which was very active. I have tons of stories from that place. The first was taken in my house 4/24/04. Only me, my husband and baby were in the house and we dont smoke. It was about 6 at night. We have had books and outher things fly across the room, Doors slaming, and things moved. Three outher people that live in our complex have had similer things happen. The second photo was taken aug 22 this year at about 11 pm by my husband behind our house. It was clear and the wind was not blowing. All the circles are more then likley dust or pollen, but what is the blue thing? There is no lights or buildings behind us just an old abandend farm.I did use photo shop to lighten it up to make it easier to see. Little Angel, your first shot looks just like Corvette's famous ecto shots. Very nice. Little angel that is a great ecto pic. Looks like someone looking over that little cutie you have there..
Hebegeebe, I do not believe this leaf is being suspended by a spider web. I understand exactly what you are explaining about how the leaf was twisting in the air. I think we have determined too quickly that it is just a spider web and brushed it off as such. I think there may be something else going on here, more than meets the eye. I used to clean houses and have experience with cleaning plenty of spiderwebs. Now objects which are caught in a web do not move in the way Heebs described. The object will twist in the circular pattern or swing side to side if there is a draft. That's it. Not in all angles. Not that I am privy to how a spider behaves but I have never seen a web span that far. I will be happy to do some research on the subject of spider webs though. Edited by MandaPanda, 02 November 2004 - 11:57 AM. I am think I am dissproving my theory that the dangling leaf is something supernatural, but this is what I found about spiderwebs. All young spiders, and some adult males, release long silken threads to float or ride the wind to new areas. This is called ballooning. Mark Carwardine says in The Guiness Book of Animal Records 1995. "Spider silk is the strongest of all natural and man-made fibres.... It is even stronger than steel: the dragline of a European garden spider (Araneus diadematus), for example, can support a weight of 0.5 g (0.002 oz) without snapping, whereas a steel strand of similar thickness will snap under the strain of just 0.25 g (0.01 oz)." A spiders' dragline would have to be 80km (50 miles) long before it would break under its own weight. Spider silk also has the ability to stretch about 30-percent longer than its original length without breaking, which makes it very resilient. A dragline is an excavating machine in which the bucket is attached by cables and operates by being drawn toward the machine Spiders spin similar draglines to help them travel from one area to another. This research has proved it is possible for the "floating leaf" to be dangling from a dragline produced by a spider. Sorry Heebs! I'm impressed with the analyses on here. Good job to all! Looks like pictures in my home! Very cool! I have one that I would like you all to see. 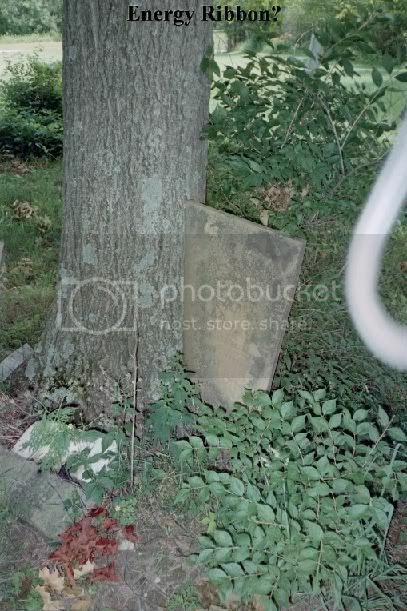 I took this pic back in June, 2004 in the first cemetary in Logan County ,Ohio. It was a bright ,beautiful summer day around 1:30 pm with little to no humidity. This was not the camera strap, as it was securely around my wrist as I shot this.The lens was clean as well as I used lens wipes to make sure the lens was clean. As it was my first hunt, I did everything I could to make sure that whatever I caught on film was real. And this one pic was the only one out of over 50 to come out this way. You can see more of my pics of this cemetary by clicking on my link in my sig if youre interested. Edited by astrodaddy, 05 November 2004 - 09:01 PM. I remember this pic, Astro. I thought it was a pretty good pic, myself. As for analysis; If you say your strap was around your wrist and there's no possible way that could be your strap in the pic, then I have no reason to doubt your credibility. It doesnt' resemble a bug, dust, humidity, or any other natural occurance. 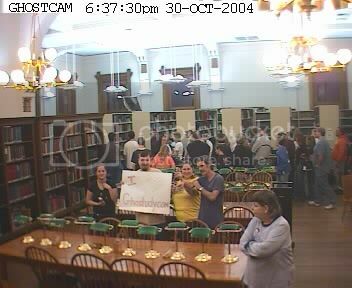 And after seeing you on the Willard Library cam, I doubt it's your hair! I also see where it seems more dense in the middle. I noticed the pattern is circular or 'coiled' in appearance, as opposed to triangular or angular (which may indicate a weaved pattern as in a camera strap). That's all I have, and some may disagree or have a better observation. I think it has definate merit. Hi fellow hunters and seekers. This one always made me wonder. I don't know if you remember this from the old board but I have posted them there. And this was taken by my best friend with a diffirent camera just 2 seconds ore so later. I hope you can say something about the pics. I forgot I had some older "questionable" photos that were taken while I was visiting the Moonville tunnel with my cousin. There were taken from one of our earliest trips out there, several years ago. Unfortunately, he had his camera set to take low quality pictures, so the resolution isn't really as good as you'd want when it comes to looking at details in a picture. The story: Moonville was a small mining town which has long since disappeared. There might be a few foundations around, but we haven't even seen any in the dozen or so trips we've made there. The one remaining feature that brings everyone back is the abandoned train tracks / tunnel. In order to get to the tunnel, you either take a long walk along the edge of Raccoon Creek - or you try to cross the creek itself on all of the rocks that are in the water. The latter was the method we chose when my cousin took these pictures of me. The weather conditions were nice. No rain, not terribly cold, no fog, etc... basically, the fog that is seen in two of those photos was not visible to the naked eye there, nor would we have expected it to show up like this in those photos. (Neither one of us were smoking, either) I can't recall if the flash fired in each of those photos, but I can assume that at least in the 3rd one it wasn't - due to the visible motion blur. This series of photos just seemed unusual to me since the pictures were taken in fairly rapid succession as I crossed the creek, so I'd assume the "look" of each photo would be similar, which they obviously aren't. Any comments are appreciated... I always just dismiss the fog as some sort of trick played by the reflection of the water... but even at that, it doesn't really explain what caused it. Thanks. I think this is probably some kind of lens flare, I've been enjoying photography for over 30 yrs and I've never seen the colored circles like this. I know what the usual lens flare looks like, I know what dust on the lens looks like. However this is with a digital camera, and my cat was watching *something* flying around. (we've been saying she's watching the faeries.) Is this a new sort of digital glitch or is it something the cat sees and we don't? Seeing as you have 30 years in photography, your guess is as good as mine! LOL! Is your cat wearing a shiny tag/bauble on its collar? Is it possible that the light reflected from that - resulting in just a flare from the small light source reflecting from the tag/bauble? That may explain the color as the light bends from the tag. But, I am no science or photography expert, so that is just a guess. I still think it's a pretty picture. Thank you for sharing. I've seen these before. I just don't know what to make of them. The first one is so close to the lens, it's hard to tell what it could possibly be (or not be). The second one is strange, too. It seems more feasible to relate this as possibly paranormal, but I just don't know. If it were something draped over the chair, it would be just as in focus as the chair is, and yet it doesn't seem so close to the lens to cause that much blurring. It seems to have depth and show movement, also. I've been patiently waiting for somebody else to pipe up and do a really great analysis of these! I'm sure you have, too. I think it's an amazing story and I like the pics, but as far as analysis goes, I'm just not sure what to make of them! No takers on this one yet? I know it isn't very exciting, but I was expecting someone to really rip into it and explain what we're really seeing in those pictures. No fog, no rain, not too cold, and no smoking. I have seen my breath in temps that were not that cold, but it was certainly not this dense. I don't think that flash, or no flash has anything to do with the blur in the one pic. I also don't think it would have made much difference with the pics in question. I really don't know what else to say. Hopefully someone else will post their ideas on it. Sorry I can't be of much help in 'ripping into it'.